July 6, 2013 Evenstar SaimaLeave a Comment on Kimi on 2014 plans: I look at the details! 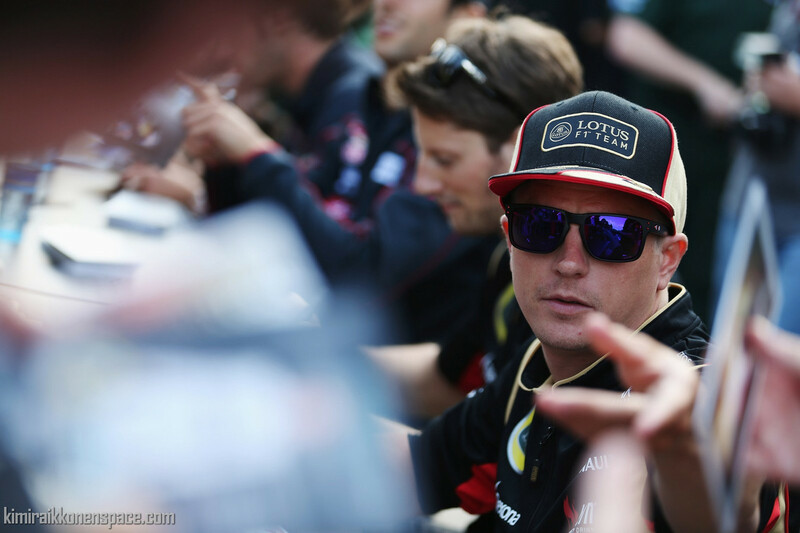 Kimi on 2014 plans: I look at the details! Q: Kimi, in 2009 Ferrari seemed like they couldn’t wait to get you out of their cockpit but three and a half years down the road you are now the hottest thing in an overall in the paddock. Are you surprised about your huge increase in popularity? Kimi Raikkonen: No, actually I’m not. Last year when I came back was not too bad and this year has been pretty okay. Things change quickly in Formula One. There have been many reasons for what happened in the past – but it is the past. Now let’s see what happens in the future. KR: …no, I am just doing my own stuff and obviously there are some people who like it. (laughs) I am only trying to do the best for myself and the team. Q: When will you make a decision about where you will race next year? KR: I have no idea. I will obviously decide at a certain point but there are still a lot of things that have to be right and good things always take time. I have no deadline. Q: You have frequently said that you feel comfortable at Lotus. What does ‘comfortable’ mean to you? KR: I want to do what I want. That’s it. Q: Do you think you will have that luxury if you move somewhere else? KR: …yes, and I have always looked to get the maximum in that respect. But yes, at some teams you have a little more to do than at others. It largely depends on the sponsors. The important thing for me is that I can do my stuff and that has not been different in the past and will not change in the future. Q: People dismiss lightly that money could be a decisive factor for you but, on the other hand, it is no secret that money makes the cars go round. What role could a well-stocked piggybank play in the decision process? KR: The money is one part of it but there is also another side to the coin. Whatever the decision will be, it will be very similar to what the situation is now in terms of the ‘piggybank’. Q: Do you still dream of another title? KR: That’s why we are here. If it doesn’t happen this year we will try again in the future. It is always the aim to win races and championships. If it doesn’t happen it doesn’t happen, but at least we keep trying. Q: Hand on your heart. Is the title still on your agenda after all these years you’ve been in Formula One racing? KR: Of course. Otherwise I wouldn’t be here. Q: You seem to have a good time here so why break your back? Q: What factor could play to Red Bulls advantage? Adrian Newey? KR: …I’ve raced cars that he has designed! At Red Bull they want me but I have other choices – so time will tell. Q: It wouldn’t be a surprise if those teams that develop engines and chassis have an advantage over the others in 2014. But obviously the two teams that do – Ferrari and Mercedes – are probably not an option for you. Could you therefore deduce that Red Bull might be closer to Renault than Lotus and would that be a factor in your considerations? KR: Stop, stop! I have no idea what they are doing at Red Bull. The only thing that I know is that Lotus is very close with Renault and they are working fantastically together. I don’t think that there is any difference between how the teams work together with Renault. They are very fair, so these considerations are not affecting my decision. Q: How much will the friendship between you and Sebastian Vettel play a role? KR: It plays no role in the decision. Q: What is relevant to your decision? KR: The decision has to be made in light of a bigger picture and not on single things. There are so many aspects that have to be considered. But one thing I can say is that right now I don’t know myself how the die is cast. Q: Will you sit down with advisors and management to make the decision? Or wake up one morning and know which contract you will sign? KR: I will make the decision. And if it is good or bad I will be the one to blame. I can live with it, as it has been my choice. Q: What do Sebastian and you both find so exciting in badminton? Q: Niki Lauda is quoted as saying that if you don’t move to Red Bull you are a mouse not a man. Does his viewpoint surprise you? KR: No, because it is normal for him to talk. (laughs) He can talk what he wants and I know him a little to know what he thinks. Q: Will you make a return to the podium this weekend? KR: Obviously it hasn’t been too bad today, if you compare it to the previous three races. Hopefully we can challenge for a podium tomorrow. Q: Have you been worried about the performance of the E21 in the last three races? KR: No. We just had some issues at the last races but we should have been on the podium in Silverstone. So the speed is definitely there. Q: So you aren’t worried about a development slowdown?